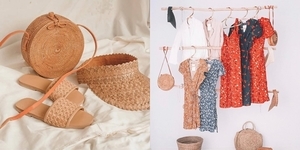 The summer season usually means a lot of things for us: beach trips, barkada getaways, any activities that you can basically do under the hot, scorching sun. For those of us who have a sweet tooth, this is also the perfect season to have more servings of ice cream to help cool us down. Craving for a cone – or two – right now? We listed ten ice cream shops that will keep you chill this summer. From the geniuses of Wildflour Café and Bakery comes Farmacy, a shop inspired by old school ice cream parlors and soda fountains. Since opening in 2014, the place has accumulated quite the following thanks to its fresh homemade ice cream, sodas, cakes, coffee, and pastries. The shop offers many unique flavors, some of which incorporate alcohol. 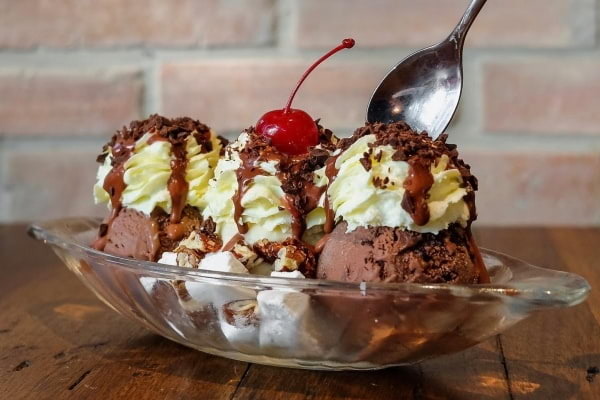 Though if you want to stay on the safer side on your first visit, we recommend getting their Rocky Road ice cream – a perfect trifecta of chocolate, vanilla, and double chocolate ice cream scoops sprinkled with candied pecans, mallows, and choco chips. Whipped cream, chocolate sauce, and a cherry on top sweeten the deal. Here’s a question for all the milk tea lovers out there. How do you make your favorite drink even more special? The answer: by adding ice cream to it! 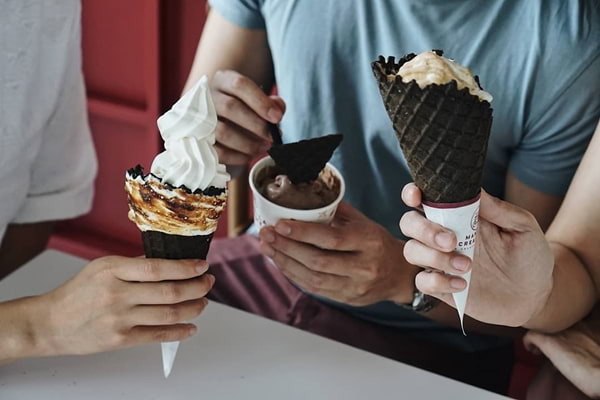 Black Scoop Café is one of the pioneers of this amazing idea when it first served Pearl Milk Soft-Serve in flavors like Okinawa, Wintermelon, Chocolate, and Caramel. But that’s not the only innovation that this ice cream shop has invented. 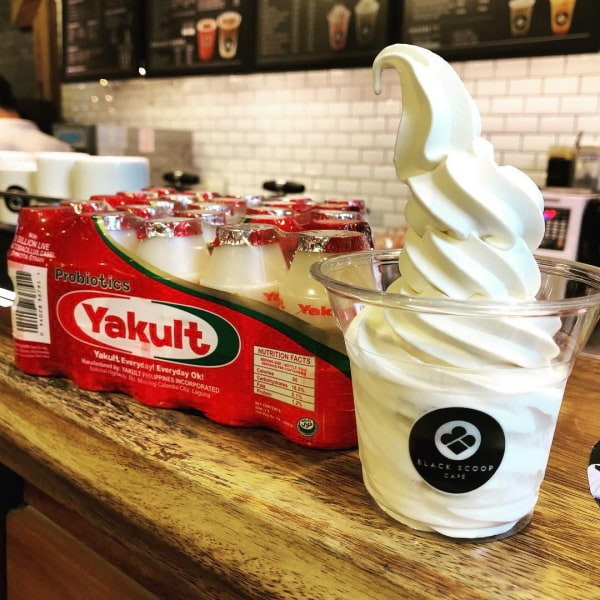 Most recently, the place has created buzz again for releasing a White Rabbit- and Yakult-flavored soft serve. If that’s not genius, we don’t know what is. Mad Mark’s has become a legend for two things. One, for its affordable steaks, and two, its to-die-for scoops. All of its ice creams are made from scratch and give out a perfect blend of flavors that are not too overwhelming to the palate. There’s also a wide range of flavors to choose from too, like Choco on Choco, Madagascar Vanilla bean, and Dark Roast Sumatra. Haven’t tried it yet? 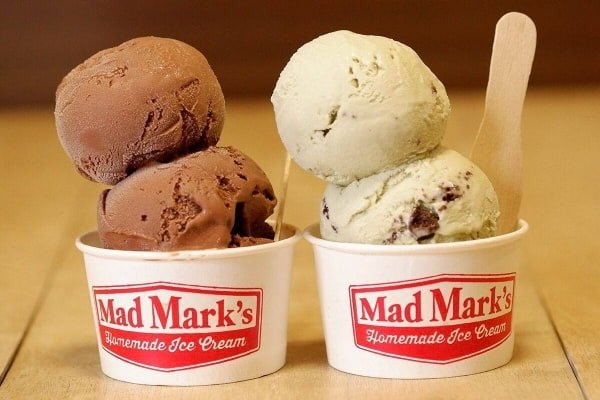 Best-sellers Javan Chocolate and Half Baked Madagascar will definitely put this ice cream shop into your regular dessert rotation. Pinkberry is not playing around with its slogan: It tastes as good as it makes you feel. Though the LA-brand is more known for being one of the OGs in the froyo world, it also offers its refreshing take on sundaes and ice cream pops. Pink Berry stays true to its brand for its other iced treats, too. You can expect the same light flavors that are not too overwhelming to the tastebuds on every bite of their ice cream. Just like their signature froyos, you can also choose to add some toppings into your cone or choose your preferred dip for your popsicles. We love adding those colorful candy sprinkles for that extra add of flair on ours! Gelato gets a wonderful upgrade at Manila Creamery (also styled MNL Creamery), a local brand that combines the sophistication of gelato with the craziness of the Filipino palate. Every scoop and cone from this shop is guaranteed to give you a wonderful surprise with combinations of flavors that are as unique as they are good. There’s the Black Sesame which is a medley of bittersweet notes and nutty tones, and the Tablea Lava Cake which is just like our favorite pastry turned into ice cream. 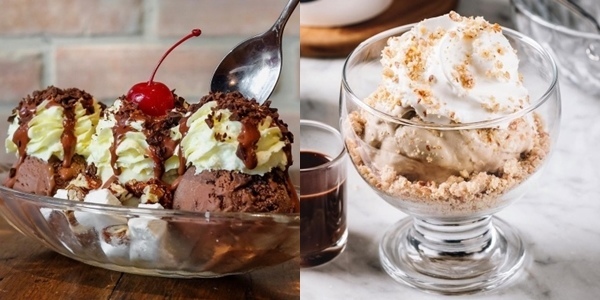 Manila Creamery also showcases local flavors which are unmatched when it comes to originality. Have you ever tried an ice cream flavored Tinutong na Kanin or Biko Gelato? We don’t think so. 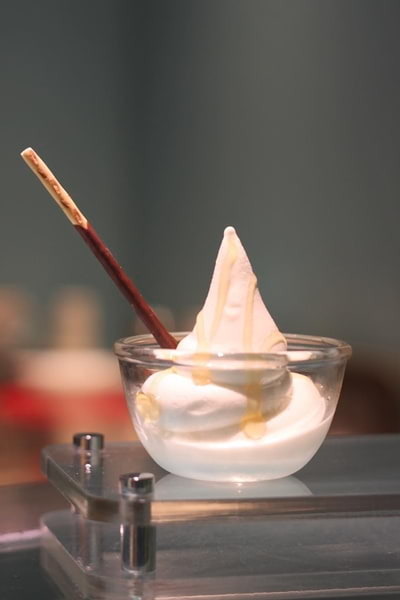 Hailing from Seoul, South Korea is Kiss the Tiramisu, a dessert shop specializing in tiramisu-turned-ice cream goodies. 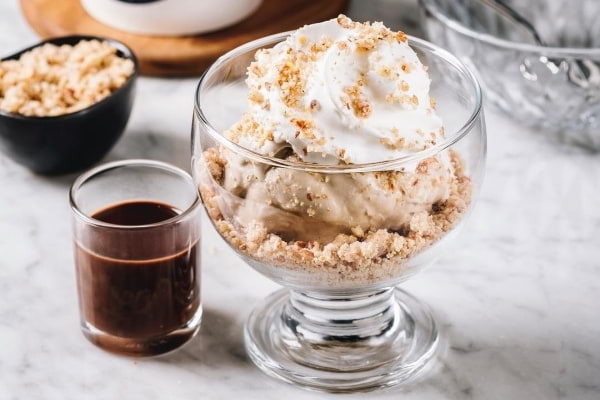 For its Classic Tiramisu Cup, the shop serves a combination of vanilla ice cream, mascarpone cheese, coffee sauce, cookie crumble, mocha, and dark chocolate shavings. 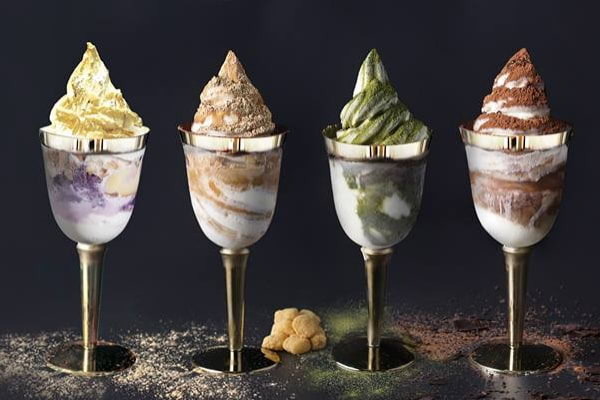 Kiss the Tiramisu offers other flavors as well like Matcha and the very interesting Billionnaire’s Cup which comes with a real 24k golden leaf topping. Each soft serve is prettily arranged on a gold-designed cup which you can take home and bring again on your next visit. 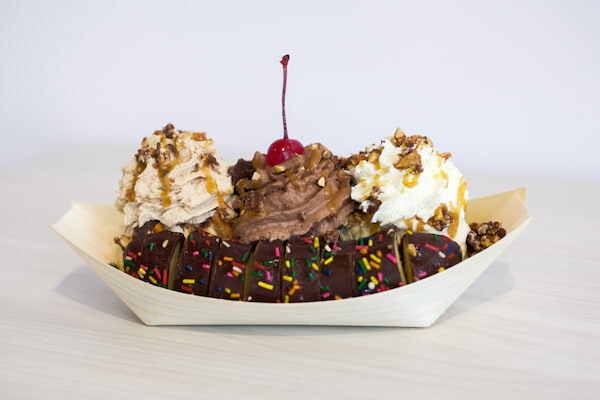 When it comes to ice cream and other sweets, Sebastian’s Ice Cream sure knows what it’s doing. This local dessert haven is as Filipino as it can get with its experimental take on flavors that include signatures like Sapin-Sapin and Champorado. You can opt for single scoops of its IG-worthy ice cream, or if you’re feeling like treating yourself, a cup of its colorful concoctions that are as delicious as they are pretty. Go and try its Dipped Banana Split which you can customize according to your preference of flavor, toppings, sauce, whipped cream, and frozen banana. The store also released a line of milkshakes that you can chase down your dessert, just in case you want the ultimate sugar rush. If we’d describe Emack and Bolio’s in a few words, it’ll be “ice cream on steroids.” The moment you walk into its shop, you’d know this is no ordinary sweets stall. 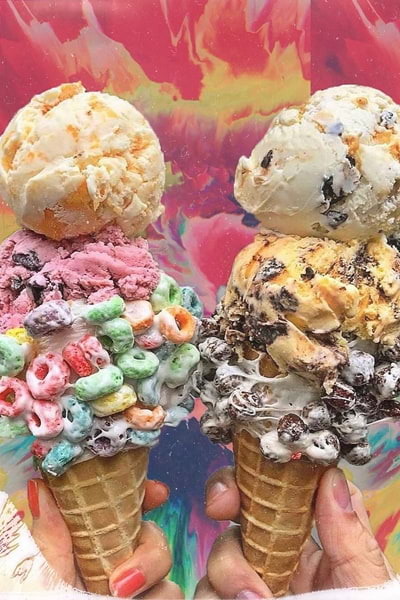 Besides from the psychedelic walls that reminds of hippie culture, the display of unique ice cream flavors in crispy fresh waffle cones with chunky cereals will take your breath away. Emack and Bolio’s started its business as a shop that pushed the limits when it comes to ice cream combinations and this sense of adventure has given way to must-try flavors like the Space Cake, a medley of cake batter, red velvet cake, and shortbread cookies. If you’re looking for a refreshing treat this season, go for the Lemon Sorbet. It's like summer in a cone, we promise. From the sunny shores of Australia comes St. Louis House of Fine Ice Cream & Dessert, a one-stop shop for anything sweet and delicious. The shop offers sorbets that are fat- and dairy-free and also uses exotic ingredients from France and Italy. 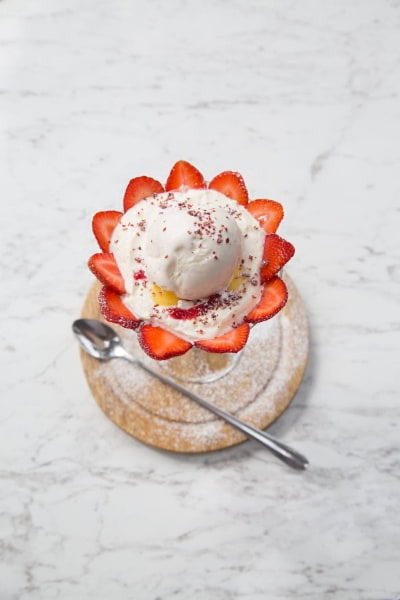 Try the Eton Mess, a concoction made of wild strawberry ice cream, lemon curd, fresh strawberries, raspberry coulis, crushed meringue, and whipped cream. Besides from its cold treats, the shop also offers some pretty mean churros and waffles. For years now, Carmen’s Best has proven again and again that they are unbeatable when it comes to being one of the best ice cream brands in the metro—if not the country. But did you know that the business started by selling milk only? Since its 100% fresh milk didn’t have a long shelf-life, Paco, the son of the owner decided to turn it into ice cream. What started as three flavors (chocolate, strawberry, and vanilla) has now grown into a wide collection which includes Brazilian Coffee, Malted Milk, Birthday Cake, and Vietnamese Coffee. Carmen’s Best sells different-sized pints of their smooth, expertly-flavored treats on some of the biggest groceries, restaurants, and food shops nationwide.